1 drawing on paper mounted on cardboard ; 5.625 x 3.125 in., on sheet 7.125 x 5 in., cardboard support 8.125 x 6 in. 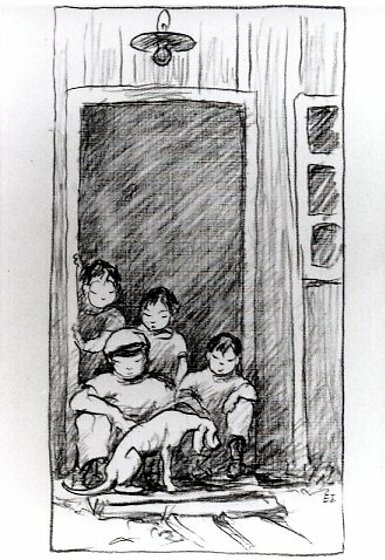 Pencil drawing of four children and a dog in a doorway. Two bigger boys sit in a darkend doorway with two smaller children standing behind them as they look at the dog sitting before them. Lamp hangs above ; partial window drawn on right. Black line border. Same image as sketch 94.195.25.